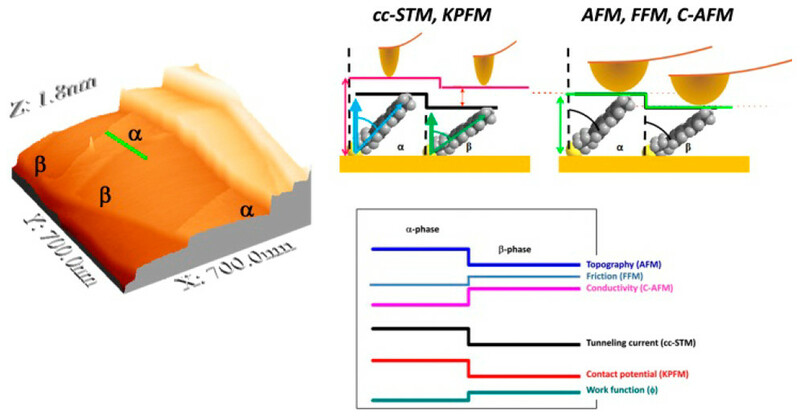 Two polymorphic phases of ω-(4′-methylbiphenyl-4-yl) butane-1-thiol (BP4) molecules formed on Au(111) were investigated by multidimensional atomic force microscopy, combining conductivity measurements, electrostatic characterization, friction force mapping, and normal force spectroscopy. Based on the same molecular structure but differing in molecular order, packing density, and molecular tilt, the two phases serve as a test bench to establish the structure–property relationships in self-assembled monolayers (SAMs). From a detailed analysis of the charge transport and electrostatics, the contributions of geometrical and electronic effects to the tunneling are discussed.